The Vewlix F is the newest single player arcade cabinet manufactured by Taito. This Red Vewlix F Cabinet features a 32 inch widescreen, rotatable, LCD screen which supports resolutions from 640x480 (VGA) to 1360x768. 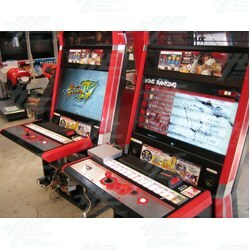 The 2012 Edition is the latest update for Super Street Fighter Arcade Edition. It features the full roster of 25 characters and adding about ten new characters from Street Fighter IV. New character include: Adon, Cody, Dee Jay, Dudley, Guy, Hakan, Ibuki, Juri, Mokoto,T.Hawk. Minor tweaks and adjustments have been made to nearly every character, while other characters such as Gouken, Yun, Yang, Evil Ryu, Fei Long and Hakan have been significantly changed in order to address global balance issues.